Product Description:- Healthy individuals generally have very small amounts of NMP22 protein in the urine. However, the level of NMP22 protein is often elevated in the urine of patients with bladder cancer, even at early stages of the disease. 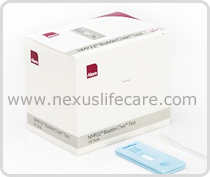 1The Alere NMP22® Test is an enzyme immunoassay for the quantitative determination of nuclear mitotic apparatus protein (NuMA) in stabilized voided urine. NuMA is an abundant component of the nuclear matrix proteins (NMP22). The Alere NMP22®BladderChek® Test is the only in-office test approved by the FDA as an aid in the diagnosis and monitoring of bladder cancer in conjunction with standard diagnostic procedures. Both assays are painless and non-invasive and detect elevated levels of NMP22 protein.